Branded fuel suppliers began to use colorants in the 1950’s as a means to indicate fuel type, grade, or brand in the downstream petroleum industry, and this approach continues with wide-spread acceptance today. As fuel taxes and subsidies came into use around the globe, it was an easy extension to use this approach as an indication of taxes paid (or exempted). The use of overt and covert dyes and field kits and devices to read them continue to be a backbone of many fuel marking programs. They are relatively inexpensive and allow non-technical personnel such as police and revenue inspectors to have some level of rapid field indication of illicit activity. This enforcement work is usually backed up by laboratory testing to confirm the identity and amount of marker present in the fuels in support of prosecution. While visual colorants are low cost and easily implemented, as tax markers they have several disadvantages, including their ease of replication and removal from the fuels. In addition, because many fuels have some inherent color, visual determination is made difficult for many people, especially those with some degree of color misperception. Markers evolved to include more proprietary compounds, designed and developed for fuel marking. To overcome the shortcomings of a human visual assessment, machine readable features that are easy to use and give unambiguous results were developed. The application of portable devices for analysis of fuel markers also enabled a more rigorous quantitative analysis, making dilution detection in the field more reliable. Systems which utilize fluorescence (Forshee 2012) or absorbance (Banavali 2007) of invisible markers have been described. These devices are small, simple to use, and require very little maintenance. Further enhancements of these types of devices have led to very sophisticated fuel analyzers, capable of analyzing multiple markers, in various fuel matrices, with little to no operator intervention to enable accurate measurement. Coupled with modern smart devices such as phones and tablets, these analyzers can give real-time GPS verified results and integrate with applications to manage workflows and data capture. Because fuel integrity programs are often instituted to meet a wide range of objectives, each implementation is different. For example, a country may choose to deploy a “national marker” program, indicating that all taxes have been fully paid on fuels. In essence, the marker serves as a “chemical tax stamp” for all taxed fuels. In this type of deployment, inspectors will be looking for the dilution of the fully taxed fuel due to the addition of a lower-taxed or diverted petroleum products, which do not contain a marker. In this case, accuracy of a quantitative result is paramount. To maintain program integrity, it is essential that the security of the marker is maintained with regular audits to maintain program integrity. Another typical application is where a country needs to protect the use of subsidized petroleum products that can be used outside of their intended subsidized market. In this case, the fuels would need to be treated with laundering resistant markers to prevent criminals from potentially removing the markers to prevent detection. The simple presence of the marker in a non-subsidized fuel application could be enough to indicate illicit activity, reducing the need for quantitative results on the test. Some have advocated a “forensic test” in the field approach. Such an approach requires “portable” instruments that require support (e.g. power, gases, and environmental control) from the vehicle in which they are mounted. This approach can limit the number of testing systems deployed due to cost of the platform that includes a vehicle and the associated support. In addition, the idea of deploying a forensic test into the field as opposed to performing the test under laboratory controlled conditions is yet to be defended in courts, where the approach may find considerable challenges. In fact, two of the largest marker programs, the EU’s Euromarker and the United States Internal Revenue Service’s red dye marker have published reference methods (Linsinger, et al. 2004) (ASTM International 2009) and collection protocols required to support enforcement and prosecution. 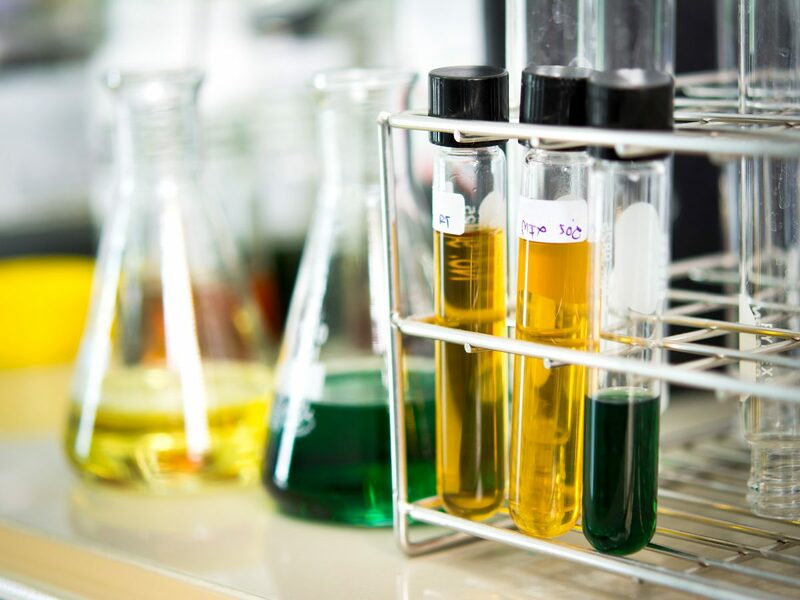 The proper collection, chain of custody, and analysis of samples for support of litigation is well documented for many forensic activities such as drug enforcement, crime scene investigation, and environmental monitoring. Following similar procedures for fuel sampling allows authorities to continue to deploy relatively cost effective field enforcement tests like covert machine readable features, while providing forensic evidence with a proven laboratory test protocol. In the laboratory, GC-MS is used for analysis of fuel markers for over twenty years to provide unequivocal forensic level support of fuel marking program enforcement. Markers designed to exploit GC-MS offer definitive forensic evidence of the origin and condition of a fuel. The markers are covert and robust, resistant to laundering agents, and compliant with the most stringent environmental regulations. The analysis is very accurate, with limits of detection in the low parts per billion (or lower in some fuels) and very good accuracy and precision, as good as +/- 1% on the analytical method itself. Fuel marking technologies have evolved from the use of colorants and dyes to covert markers and machine readable features. Field portable analyzers have greatly increased the accuracy of enforcement, and reduced the burden on personnel by making test results definitive and quantitative. Markers have become more robust and resistant to laundering and meet the most stringent environmental, health and safety regulations. Finally, the development of powerful laboratory controlled forensic molecular marker sets based on GC and GC-MS have strengthened the legal standing of these programs, enabling government agencies to enforce laws that protect subsidies and taxes on petroleum products. ASTM International. 2009. “Standard Test Method for Determination of Solvent Red 164 Dye Concentration in Diesel Fuels.” ASTM Standard D6258 . West Conshohocken, PA: ASTM International. Banavali, Rajiv M. & Ho, Kim Sang. 2007. Pyrazinoporphyrazines as markers for liquid hydrocarbons. United States. Patent 7,157,611. Published January 2 2007. Forshee, Philip, & Kottenstette, Peter. 2012. Tagged petroleum products and methods of detecting same. United States Patent 8,129,190. Published March 6 2012. Linsinger, T., G. Koomen, H. Emteborg, G. Roebben, G. Kramer, and A. and Lamberty. 2004. “Validation of the European Union’s Reference Method for the Determination of Solvent Yellow 124 in Gas Oil and Kerosene.” Energy & Fuels 18: 1851-1854.